Shane Walsh remains sceptical regarding the GAA's experimental football rules but would not be opposed to seeing them further trialled in this year's National League. The association's Central Council will meet this weekend to decide which, if any, of the five tweaks will be adopted for the league. The limiting of handpasses to three in succession, a sin-bin for a black card offence, a requirement for sideline kicks to go forward unless they are inside the opposition 20m line, a requirement for kick-outs to be taken from the 20m line and the offensive mark have all been on show during pre-season tournaments. 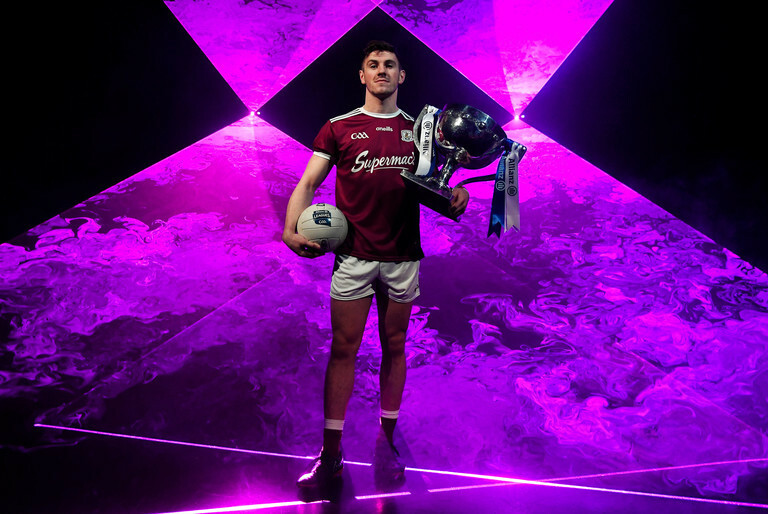 "It's a big jump and no one likes change, especially in Ireland," the Galway footballer said at the launch of the 2019 Allianz Football League. Walsh thinks the sin bin and new sideline ball rule are the ones which have worked best so far. He can also see pros and cons to the offensive mark. Having Damien Comer on the edge of the opposition square is surely gives those pros a bright hue. It is the new handpass restriction has elicited a racket from all corners of the game. "The hand pass rule seems just a bit daft with three. You’ve gone from a record number of handpasses in a game to three handpasses consecutively. "Looking back last year at a goal of the year contender, Corofin against Nemo Rangers in the All-Ireland club final, it was a hand pass move that blitzed the team, there was seven or eight hand passes in that move. It ended up in one of the best goals. No one talked about the hand pass going into it, it was all about the team play that led to the goal. I think that’s a big thing." Walsh is yet to play a game during this experimental period - he was in the stand at the weekend as Galway beat Mayo on penalties to qualify for the FBD League final. Neither has he done a whole lot of work on the new rules in Galway training. You saw the last day we got caught out a couple of times with the handpasses and different things like that. It's very tough. I remember the first point Mayo got in the game, it was off a mark and your man nearly got flattened because the ref forgot to blow for a mark. It's tough on refs, I think, that's the big one. Maybe they're the people who should be interviewed on the rules to see how they're working because they're the ones that are going to be under the spotlight and are already under the spotlight heavy enough as it is. If the handpass limit is adopted, the 25-year-old does see an opportunity for teams to play a more direct style. "With this handpassing [rule] people are automatically counting numbers and this sort of thing instead of just simplifying it. If the ball can be moved forward quickly, move it forward quickly; it's not a case of we have to count this handpass and use the three and then kick. Just play the game as you see it. "If we can get the ball from 'A' to 'C' by skipping 'B', that's the aim of the game. "The game has evolved so much, the pace, physical strength is a huge part of the game now. We'll be looking to exploit that from the youth that we have in the squad. "Everything has been put in place for us and whatever rules are there we'll play with them as we go along." The inter-county famine is about to end, giving way to a nine-week feast of Allianz Football League action between the weekend after next and the four divisional finals in Croke Park on March 30/31. The exciting programme features 116 games across the four divisions in a campaign which will mark the 27th year of Allianz’ partnership with the GAA as sponsor of the Allianz Leagues, making it one of the longest-running sponsorships in Irish sport. In attendance at the Allianz Football League 2019 launch in Dublin are, from left, Ryan Wylie of Monaghan, Shane Walsh of Galway and Stephen O'Brien of Kerry.